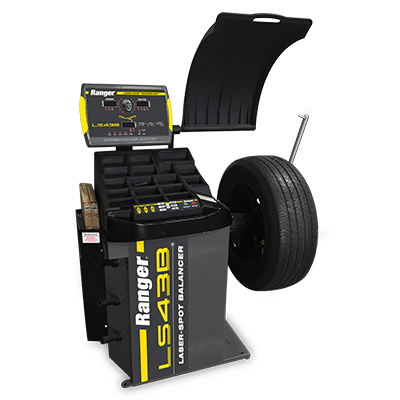 The LS43B wheel balancer by Ranger optimizes wheel weight placements with our exclusive Laser-Spot™ technology. A laser line clearly indicates both outboard and inboard weight placements for incredible balances within hundredths of an ounce. Wheels that are laser-balanced will drive like new! The Ranger LS43B wheel balancer handles wheels up to 43inches in diameter. The average cycle time is just 7 seconds, making it one of the fastest and most reliable balancing machines ever built. The standout feature on this model, of course, is Ranger's exclusive 3D Quick-Touch™ Laser-Spot™ technology that highlights the pinpoint location at which operators should place the minimal amount of weight in order to achieve a perfect balance at the 6 o'clock position. Ranger makes it easy to seamlessly determine the exact weight placement position. Only a single weight placement should be necessary for most wheel and tyre configurations. Lasers are increasingly being used in high-volume shops because they speed up weight placements by eliminating any second-guessing. This also means the balance check you perform after placing the inboard and outboard weights will almost always be clean. The fewer weights you use, the better your bottom line. Plus, customers will enjoy long-lasting balances that make their rides feel like new again. The LS43B tooling package not only includes our standard car and light truck cones, as well as a heavy-duty truck cone and spacer ring. This well-equipped package includes three automotive and light truck cones: 1.75” - 2.75”, 2.75” - 3.50” and 3.50” - 4.25”, as well as one truck cone 4.50” - 5.00”. An open-top side shelf accommodates a large roll of Ranger Quick-Peel™ adhesive tape weights. Additional weights are available for purchase at any time. The LS43B automatically calculates the minimum amount of weight needed to achieve an optimal balance for the tyre and wheel configuration, so you use less weight. This adds up to real savings and increases your bottom line. An anti-reflective, touch-pad display panel features tyre and wheel assembly graphics that help simplify the speedy entry of wheel data. It efficiently guides techs through each balancing procedure. Operator function keys are labeled with simple, easy-to-read icons to help operators identify and command all balancing functions. A free kit of wheel weights is included with your brand new LS43B wheel balancer. Each unit’s starter kit contains one bulk roll of 100 silver adhesive steel tape weights, one bulk roll of 100 black adhesive steel tape weights and one starter box of mixed clip-on steel weights. It’s our way of getting you off on the right foot. Additional Ranger wheel weights are available for purchase at any time.